HAPPY DEL MAR 2011 EVERYONE! 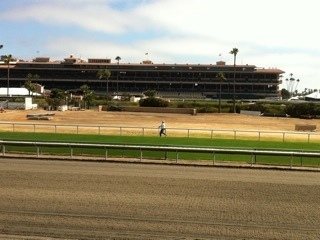 Today is the beginning of the WEST COAST SUMMER RACING SEASON at Del Mar. It is a race track that is also known by the phrase….”Where the turf meets the surf”. When you are sitting in the grandstand watching the races, the Pacific Ocean is directly to your left. The ocean breezes are always surrounding you…and the environment is breathtaking. You literally get to see the waves roll into the shore and later watch the sunset while you are enjoying each race! I remember Del Mar very well. I won the Clement Hirsch G1 there on 3 different occasions. They use the TRAKKUS system to monitor how fast the horses are moving while running…and they noted that I was closing in the 2009 Hirsch at over 40 miles per hour. NOT BAD…if I say so myself! Dress is totally California Casual. Nice Walking Shorts, T-shirts and sandals are A-OK for most parts of the track. You do need to dress ‘up’ a bit if going to the Club House or Turf Club….but it is still summer casual and very relaxed. MY TEAM tells Me the restaurants are fabulous down there. One can drive down to San Diego and eat on the water or stay in and around Del Mar and enjoy the local restaurants. I’ll share some of those with you as the season goes on. Overall, it is a wonderful change in scenery and pace for all of my friends. I truly hope that you get the opportunity to go RACING AT DEL MAR! I’m not saying Native Dancer was a bad horse or a bad producer. He had a weakness, all horses have weaknesses and in theory you breed to a partner who will bring strength to that weakness. In the pursuit of some of the ‘good’ traits in a line, breeders will forget the ‘individual’ and rather than breed to correct a fault, they breed for a characteristic. The Dancer’s ankles should never have been crossed to Reviewer’s fragility. Reviewer broke down under training 3 times. 3 times. Has nothing to do with his paddock accident, 3 times his body failed him while pursuing the sport he was bred for. You don’t cross fragile bone to ankles that top short pasterns that allow for pounding concussive force up the rest of the leg. Its asking for trouble. The Dancer crossed to mares who brought strength to his weaknesses has produced some amazing bloodlines with amazing talent. I’m not surprised he’s in Zenyatta’s pedigree, he was a good horse and a good stallion but to ignore his faults is silly. Some horses should not be bred, no matter how brilliant. We truly are lucky that Zenyatta raced sound, retired sound and looks to have a pedigree that will continue to breed soundness into her offspring. Battle of the Exes. http://www.paulickreport.com/news/people/del-mar-to-host-match-race-battle-of-the-exes-between-sutherland-and-smith/ Hugs, J.B.
Zenyatta, hope you are having agreat day with you pasture pals and staying cool. @Jane Wade, great photos, thanks. Love to Zen and kisses on your soft nose. Reviewer was sired by Bold Ruler. A son of Nashrullah and a grandson of Nearco. Bold Ruler was one of the most prominent and influential stallions of modern times. And yes, he sired Secretariat. If you think Reviewer had a suspect pedegree, you’re way off base. And you cannot say that Shenigans, who under went adominal surgery, fell coming out of that surgery and broke both legs; had a weakness from her sire, Native Dancer. It’s incredible! as a juvenile, suffered a second cannon bone fracture the next year and then was retired at four after a third fracture. We don’t know why he had that first fracture but we do know he had a stellar pedegree. We don’t know why Ruffian broke down either. Her trainer said she simply took a badstep and later speculated that the injury was the result of her mishap in the gate, when all her weight was thrown onto her right front leg as she recovered after being off balance at the start. Nobody knows for sure, what happened but her death had nothing to do with Native Dancer and no he did not have weak ankles. You need to get your information from “facts”. Read knowledgable sources. Hi, All: No cannonballs in the pool . .. ~ Love, Mama Patrona. Hi Zenny: You know,I wonder if your family and team thought about letting you visit a few of the tracks just to make an appearance to say Hi to your fans. This would be after your little Z is old enough to be on his own. I think everyone would just be so excited to see you. Is this a good idea? No racing for you, but to just do a little meet and greet. Have a good night Z and everyone. zenny i go down to del mar quite often with my family and i have two resturaunts to recomend… Las Olas in cardiff by the sea just north of del mar. it has the best mexican food on earth. and the americana just a few minutes away from the race track. it has really good breakfast and its where lucile ball and desi arnaz used to go. Mmmm … nope I’m good with my sources and my facts. Ruffian had genetic predisposition to weak bones and when she took that bad step out of the gate, the house of cards tumbled. @Zenyen, that was great. Seeking the Gold, thanks, I have never looked into the progeny lists before…something new for me, thank you. @Judy Berube: Thanks, I cannot wait to see the Exes, I was so hoping they would be back together. I know they are both professionals and will enjoy the spirit of the “Battle”. @Judy Berube: Great link to Ruffian’s Hall of Fame. I do not count the last race, I do not see it as a race cuz of what happened. It was just the two of them…She is a perfect 10/10. So beautiful is she. I do not believe that anyone loves Native Dancer as much as I do, even loving him as much as I do and his fantastic racing record…yes, he did have a weakness. Don’t we all, none of us are perfect, not even Native Dancer. To rachel: Muchas gracias for the recommendation to Las Olas. Also, would like to try the Americana – if that is where ‘Lucy and Ricky’ went…I’m in! Del Mar is definitely on my Bucket List. I am hoping to go next year if at all possible. I really wanted to go when you were racing but was not able to make it out there. I sure do miss watching you run but I am so glad you are healthy and happy. Mama P: No squirt guns either…If the ‘Ale’ is not strong enough, may have to switch to Patron’ Silver – a poquito! You’re welcome. Ruffian was a beautiful, beautiful girl. Love her. Hugs, J.B.
*crushed ice, DJ, lime on the bias ~ ‘MP’s . .. ** vespers and no running on the deck. @ Dona – “Whoa Nelly!” – YOU really need to do more research on bloodlines, compatible nicks combinations, sire/dam traits & who matches up well with who etc. It’s pretty darn complicated to say the least. . . .and then maybe a one-in-a-million-miracle. You could breed Dynaformer and La Ville Rouge till the cows come home and never have another Barbaro. There’s no evidence in the bloodlines to hearld the forthcoming greatness of a Seattle Slew or John Henry, so what then? And then there’s that “Green Monkey” on your back. I think all anyone is saying here – and who wasn’t a fan of Ruffian – is that her sire AND dam lines had both shown a proclivity toward speed and UNSOUNDNESS. Just as every turf champ or sire who showed an afinity for mud may pass on those traits to the majority of offspring, there are guaranteed exceptions to every Rule. Let’s not forget how long ago this took place & how far veterinary science & the imaging and testing for fracture, tears etc. has come since then. Ever read any articles on losing the “Iron Horse”? Doesn’t that make you wonder why? Dear Tessa: I hope you have the most wonderful Kentucky Vacation!! Our Sweet “Z” is there with you in Spirit. I was blessed to be there last year for the Breeders Cup…and it truly is unforgettable. Enjoy all that is the history of Louisville KY and the wonder and awe of the whole experience! Lexington and Versailles await you. Zenyatta, I’ll bet you wish you were still racing with the opening of Del Mar for the season. I’ll bet you do remember it very well. I associate the voice of announcer Trevor Denman with you. Every time I hear his voice, I’m reminded of you and races that you have raced in. I have seen the Clement Hersch race in which you were in, thanks to TVG Classic. They show the 2009 one, I think. I see Del Mar on TV and wish I was there. That is such lovely, beautiful scenery. I watched the day of their opening. You mentioned restaurants and made me hungry again. It just makes me want to be down at Del Mar even more.